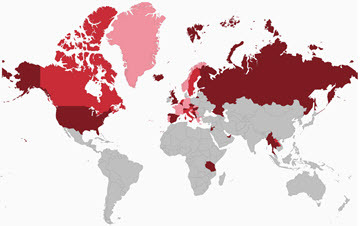 When you think of the Baltic cities, Stockholm, Copenhagen and Helsinki are likely top of mind. 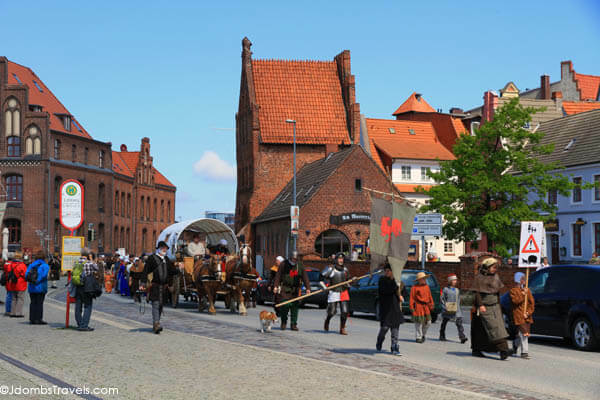 But the southern Baltic cities have a fascinating history and the Hanseatic city of Wismar is no exception. It’s amazing that Wismar is still preserved as it was in Hanseatic times. It was ceded to Sweden during the Thirty Years War, returned to the Duchy of Mecklenburg in the 18th century, suffered battle wounds of World War II, was hidden away behind the Iron Curtain, was restored when Germany reunified, and became a UNESCO World Heritage Site, along with its sister city Stralsund, in 2002. 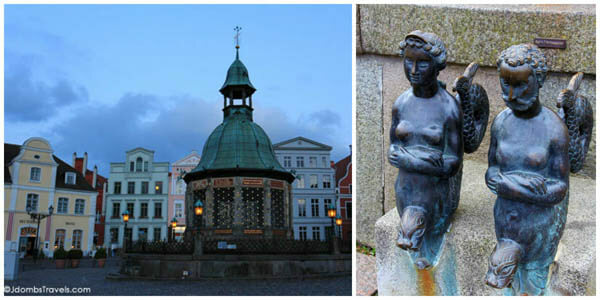 Little but lovely, Wismar is is packed with plenty of culture, history, and things to do. A group on the way to the Hanseatic Days festivities. This is what Hanseatic Wismar would have looked like! The cities of Lübeck, Rostock and Wismar formed a triple alliance in 1259 to ensure safe trading at sea and on land, and protection from pirates. The trading industry on the Baltic was booming with good like wine from Italy and France, wood from Russia, furs from Norway, and in particular fish, malt and salt. The Hanseatic trade made Wismar a very wealthy town, but the trade began to diminish after Colombus discovered America. The old harbor has been largely preserved since the Middle Ages and the best way to see it is by taking to the seas yourself. Take an hour long cruise of the harbor for beautiful views of Wismar’s skyline and to learn about the former trade route. After the cruise, stroll the harbor market for some smoked fish still sold by the boats moored in the harbor. The Gewölbe straddles the Runde Grube, the last artificial canal built in the Middle Ages to be left remaining in any old town in Northern Germany. The Gewölbe served as a quality control station where wine masters brought their port wines to be verified before trading them at the town hall. Pay a visit to the City Hall, or rather the cellar beneath it. In 1809 the former wine cellar was condemned and closed down. But in 1985 during construction work, traces of murals were discovered in the cellar from the Middle Ages. The cellar was re-opened and today houses the exhibition Wismar – Images of a City, which is free to the public. Though it houses interesting artifacts of Wismar’s history, the cellar itself is the true showpiece. 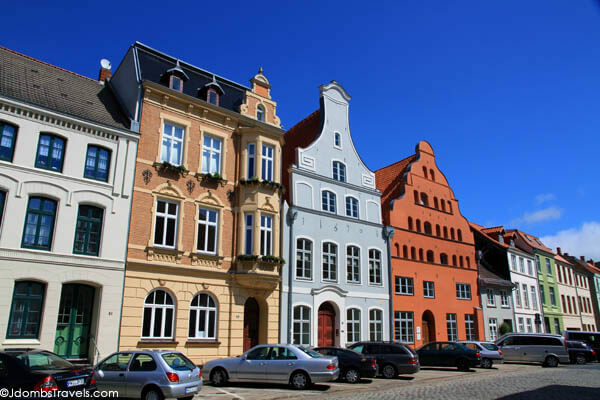 Wismar’s whimsy is truly found in its cityscape with its colorful gabled houses. Though they can be seen anywhere throughout the city, the best example of beautiful gabled houses are the ones that line the Marktplatz at the heart of the Old Town. It’s one of the largest market squares in Germany and, dare I say, one of the most beautiful. Some of the notable buildings on the Marktplatz are the town hall, the Commander’s House which was used by the Swedish commandant, and the Gothic brick gabled Old Swede. On one corner is the Wasserkunst, a Renaissance waterworks, that brought drinking water to the city until the late 19th-century. Considered a landmark of the city, around 220 houses and 16 public wells got their water through a pipe system continuously supplied with spring water from the monument.On the monument two bronze figures that are called Nix and mermaid or also popularly Adam and Eve. If the Marktplatz is Wismar’s heart, its Gothic brick churches are its soul. The three most impressive buildings of the Middle Ages are the three large former parish churches, St. Georgen, St. Marien and St. Nikolai, which were built in the 13th and 14th centuries with a combination of Italian brick technology and French cathedral style. St. Marien (St. Mary’s Church) was built in the first half of the 13th century and its clock tower was what fisherman looked for when they headed home. Once considered one of the most beautiful Gothic brick churches in Germany, only the 80 meter high clock tower survived the severe destruction suffered in World World II. Where the nave once stood became a parking lot during the Iron Curtain and it wasn’t until 2000 that the church underwent reconstruction. The former walls of the nave are once again marked with brickstone and the area will serve as a public relaxation space with sculptures once complete. St. Marien also has the Discovering Brick Gothic exhibit where we learned how the bricks were handcrafted and hand laid. St. Nikolai was modeled after St. Marien Church and became the church of the seaman and fisherman. It’s the only one of the three Gothic brick churches to survive World War II intact. 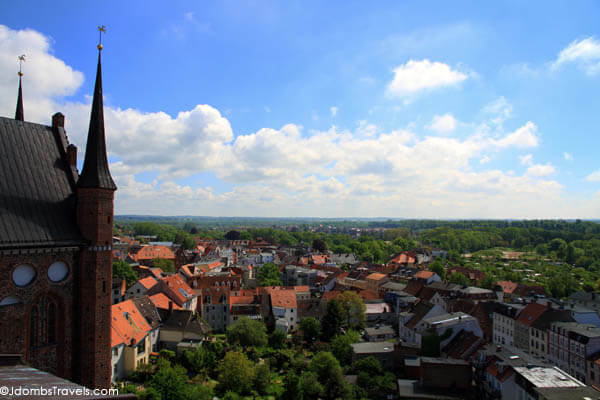 The church is still used for regular services and visitors can ride the newly installed elevator (or climb its 144 steps) for stunning views over all of Wismar. Brewing beer has been a long tradition in Wismar and it was once one of the Hanseatic city’s primary activities. There were once 183 breweries and 150 hops gardens in Wismar. Wismar beer was known the world over and ships transported it everywhere from Scandanavia to India. Beer was a source of wealth and prosperity for Wismar, but after Colombus discovered America the trade fell off and breweries closed down. Today just one remains. Established in 1452 and located just opposite the old port stands the Brahaus am Lohberg zu Wismar, who still brews their beer today with a Hanseatic recipe in accordance with the Germany Purity Law of 1516. Be sure to stop in to Brahaus am Lohberg zu Wismar at least for a liter and a fresh baked pretzel. We tried the Wismarer Maibock (only available from April 23 until sold out each year) and may have had three pretzels. Don’t judge. They were just that delicious. Brahaus am Lohberg zu Wismar is open from 11am – midnight daily. The Swedes occupied Wismar on January 7, 1632 and their presence made a made a mark in the city’s history just as important as its Hanseatic past. Though Germany’s Duchy of Mecklenburg regained control of Wismar in the 18th century, much of the Swedish period remains. Keep a look out for the Schwedenköpfe (Swedish Heads) around the city. Two that you’re guaranteed to find stand guard at the Baumhaus. The originals formerly stood on mooring posts at the entrance to the harbor, but a Finnish barge damaged them in 1902. They were re-cast as exact replicas and you’ll see them once again guarding entrance to the harbor on your boat tour. 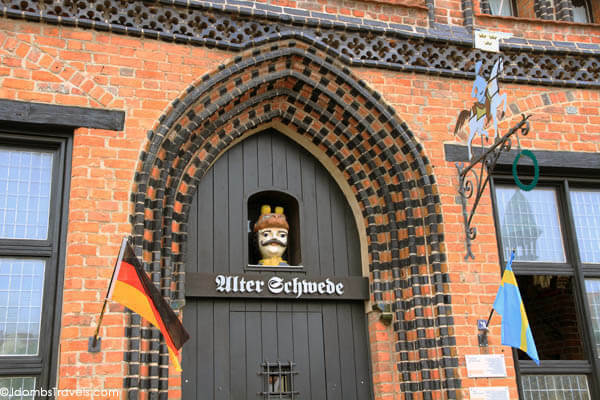 Another you’ll find is peering out at you from the doors of the Alter Schwede (The Old Swede), one of the oldest burghers’ houses in Wismar from 1380. Though Swedish buildings and flags can be found all throughout Wismar, the biggest testament to the city’s Swedish 155 year rule is the annual Swedish Festival celebrated each August. The Marktplatz becomes the center of entertainment and military camps with displays of drill exercises and Germans and Swedes alike come from all over to celebrate together. International flights are available to Hamburg or Berlin. 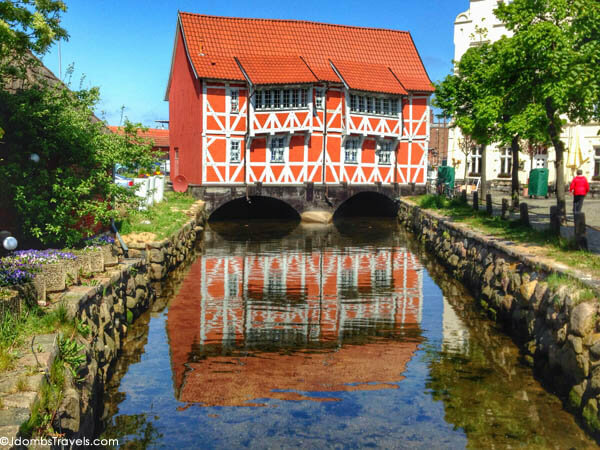 Wismar is around a 2 hour train ride from Hamburg or Berlin. All the sights of Wismar can easily be seen by foot. Stay at the Hotel & Restaurant Wismar. Double rooms are €95 per night. 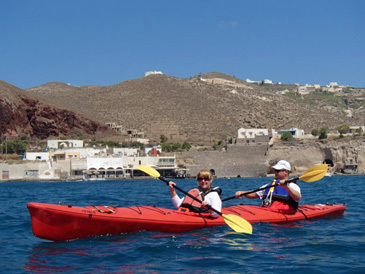 Adler-Schiffe operates harbor cruises from April – October and tickets are €11.50 per adult and €6.50 per child. We recommend dining at the Hotel & Restaurant Wismar, To`n Ossen, or trying a smoked fish sandwich at the harbor. Our UNESCO Natural Sites and Proud Cities trip was hosted by the German National Tourist Board in order to bring you this story. However, Luxe Adventure Traveler maintains full editorial control of the content published on this site. As always, all thoughts, opinions, and enthusiasm for travel are entirely our own. I was deciding between Wismar and Schwerin for a day trip last summer and opted for Schwerin. I really liked Schwerin, but your pictures makes me think I should have visited Wismar instead! I’ll have to make it out that way next time I’m in the area! What a great and informational post. I really enjoyed the pictures and the history of the trade that still fascinates me today. We have it so easy, and it is good to remember the olden days of slower delivery. Looks like a quaint place to visit. Great pictures and cute town. Looks like a great weekend escape! Beautiful! Love that photo of the brewery, you almost expect Hansel and Gretel to be in there drinking beer. I’ve never heard of this town before but it looks like a terrific place to visit! I’m rethinking my entire itinerary for Germany!